A computer piece based on a Russian Fairy Tale. In the story, a farmer's grain is mysteriously disappearing just before the harvest. When it is the turn of Peter, the youngest of his three sons, to watch he finds a horse all made of bronze devouring the grain. He catches it, and of course it agrees to serve him. This continues the next year, when he finds a horse made of silver, and the following year when the horse is made of the finest gold. About that time, the Princess of his country is forced by her father to entertain suitors. But she doesn't really want to, so she devises a task in which they must ride up a mountain made of glass, and take three golden apples from her lap in order to win her. Peter rides the bronze horse the first day, but only half way up the mountain. The princess is so taken with him, though, that she tosses him one of her golden apples. The next day he rides the silver horse three quarters of the way up, and she tosses him another apple. The third day he rides the golden horse all the way to the top, while sparks dance from its hooves, and collects the princess and the last apple. Since he already has the other two, of course, she gladly marries him, and they live happily ever after. So I have drawn the Mountains of Glass, and the horse of gold running free there. 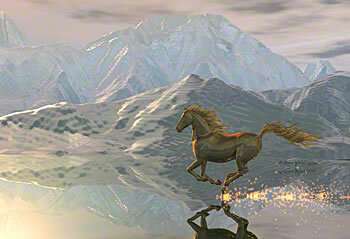 I used Poser® for the horse, and Bryce™ 3D for the mountains. Then I retouched the horse in Adobe® Photoshop®, adding the mane and tale, the sparks, and the reflections of the added bits.